and our Economy Metal Strip, the MS-32, is available in black and off-white. The heavy duty line uses genuine coil spring clips, welded to stem for secure gripping power and ease of operation, hooks will not shift over time and the economy line uses "tempered" coiled spring steel clips which provide efficient gripping power and ease of operation at a more cost efficient price. Let Clip Strip Corp. be your go-to vendor for Metal Merchandising Impulse Strips. We know display strips, after all our founder invented the concept back in 1979 as our first Clip Strip® Brand Merchandiser. We carry the best product at the best price throughout the Point of Purchase and Store Fixture's industry, so why go elsewhere? If your metal merchandising display strips are starting to look tired and abused by the wear and tear of the retail environment, you probably didn't buy from us. Clip Strip Corp.'s metal merchandising strips are built to last! Metal Clip Strip® Display Strips are stronger, more durable and will represent your brand proudly over the majority of wand retailers available on the market. Ask us about producing high quality color PRINTED HEADER labels. We have in-house capabilities to print them at everyday low prices sure to meet your budget. Our labels come standard on rolls but if you need sheets, let us know. Count on Clip Strip Corp. for retail & point of purchase display materials including strips, hang tabs, shelf dividers, peg display hooks, sign holders, fasteners and display construction components. Minimum quantity for "Heavy Duty Metal Clip Strip® Merchandising Strip, 12 Hook Stations, MS-29" is 50. Minimum quantity for "Metal Clip Strip® Merchandising Strip, 6 Hook Stations, MS-16" is 50. 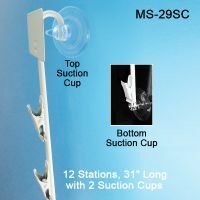 Minimum quantity for "Metal Clip Strip® Merchandising Strip, 12 Hook Stations, with Suction Cups, MS-29SC" is 50. 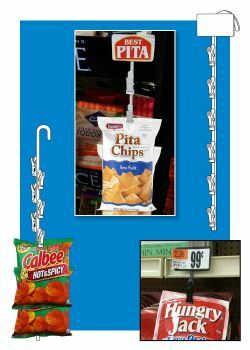 Minimum quantity for "Metal Clip Strip® Merchandising Strip, 6 Hook Stations, w/ Suction Cup, MS-16SC" is 50. Minimum quantity for "Econo Metal Merchandising Strip, 12 Hooks, MS-32" is 50. 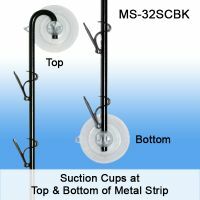 Minimum quantity for "Econo Metal Merchandising Strip with Suction Cups, 12 Hooks, MS-32SC" is 50. 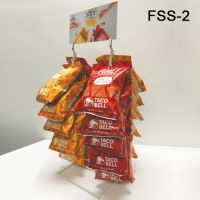 2 Wands, 28 Hooks 24 ½" H x 8 ¼" W, Base 10" x 9"
Minimum quantity for "2 Wand, Free Standing Metal Clip Strip® Snack Rack, 28 Hooks, FSS-2" is 1. Minimum quantity for "Metal Merchandising Strip With Sign Channel / Scan Plate, MS-28" is 50. 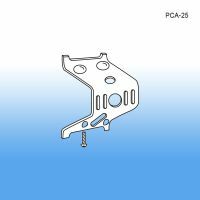 Minimum quantity for "Metal Clip Strip® Hanger Adapter Clip, 1" Wide, PCA-25" is 50. 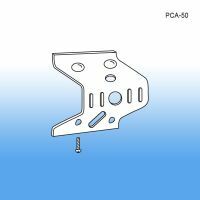 Minimum quantity for "Metal Clip Strip® Hanger Adapter Clip, 1-1/2" Wide, PCA-50" is 50.